My eBook ENDEAVOUR: The Complete Inspector Morse has just passed 750 sales. Not much in publishing terms, but it's a wee landmark for a £4.99 eBook with no marketing, no print version to enhance visibility, and a niche audience. ENDEAVOUR: The Complete Inspector Morse is an unoffical non-fiction guide to the TV series Endeavour and Inspector Morse, to Colin Dexter's original novels and short stories, plus Morse on radio and stage. All the non-Endeavour material in the eBook had previously been published as The Complete Inspector Morse [TCIM] by Reynolds & Hearn across four editions, and then by Titan Books in a new 2011 edition. Those were all print only, a mix of paperback and hardback. Titan later issued an eBook of TCIM but numerous reviews berated the low quality of its formatting. A reference text should enable readers to dip in and out of an eBook, not force them to scroll through hundreds of unchaptered pages to find what they seek. In 2016 Titan confirmed it would not commission a new edition, but the company declined to revert rights in the book until the physical print run had sold out. That was estimated for 2017, and under the terms of my contract, Titan could wait another two years before reverting my rights. I signed my original contract with Reynolds & Hearn in 2001, long before eBooks. R&H did obtain the electronic rights, but only on a non-exclusive basis. After some prodding Titan confirmed I could publish my own eBook, if I wished. For the cover image, a fellow Endeavour enthusiast provided a photo taken during filming in Oxford - instead of paying a fee, they suggested I make a donation to charity. I happily paid Caroline Goldsmith to prep the eBook for upload [I recommend her!]. I made the eBook an Amazon exclusive priced at £4.99 - not cheap for a non-fiction eBook. I published ENDEAVOUR: The Complete Inspector Morse on December 23rd 2016, just ahead of the 30th anniversary of Morse first appearing on British TV. After Amazon took its cut, I estimated the eBook needed to sell 100 copies to break even. Happily it passed that a year ago, thanks to Endeavour Series 4 being broadcast. To my surprise, ENDEAVOUR: The Complete Inspector Morse has continued selling, even when new episodes of Endeavour aren't on screen [which is most of the year]. It's a steady wee earner, as the sales chart above demonstrates. Despite being only an eBook, I've made far more royalties from this edition over the past year than I did from the traditionally published print versions of TCIM. 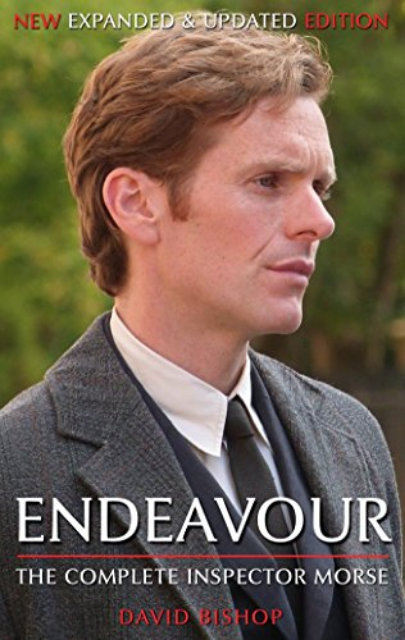 New episodes of Endeavour makes a big difference, but so does 70% royalties instead of 7-10%! After some gentle prodding Titan have now reverted all rights in the book, meaning I can publish the next edition in print and eBook if I choose. There's plenty of new material to add, with 10 new episodes of Endeavour and an Inspector Morse radio play. But for now I'm happy to enjoy a wee landmark, and look forward to watching another new episode of Endeavour on ITV tonight. Onwards! Every year the Public Lending Right sends registered authors a statement estimating how many times their books were borrowed from UK libraries. To compensate for lost sales, the PLR pays 8.2 pence per loan. There's a maximum payment threshold [£6600] to prevent bestselling authors from draining the PLR's precious coffers. About 22,000 authors get payments for the most recent PLR period [July 2016 - June 2017], with 195 on the maximum of £6600. The fate of the PLR is in flux, as cash-strapped councils close libraries and eBooks alter reading habits. But authors still welcome this new year bonus. It is free to register your books for PLR - just go here. Even if you only wrote [or drew, in the case of comics artist] part of a collection, you can still register your bit. I represent a tiny 3% of the Heavy Metal Dredd graphic novel, but it makes me a few pennies. Like a fool, I forgot to complete registration for the only new book I had published in the most recent PLR period - tsk! This year's top ten for my titles features several 2000AD-related tomes, two editions of the same Doctor Who novel, a Warhammer tie-in, and a hugely unsuccessful non-fiction book about the films of Michael Caine. That last book sold so badly, I think more people have read library copies over the past 15 years than ever bought the damned thing when it first came out in 2003. It's a nice surprise to the Heroes Reborn tie-in to which I contributed appear on this list. I wrote an ebook novella and didn't expect anything to come of that, but it was reprinted by Titan with two other novellas from the series as a wee omnibus. Anyway, here are my top ten titles in librares for July 2016 - June 2017 (with previous year's placing in brackets).